Syria responded to Lebanese protest babes with professional bombings. Now the focus in one of the Mideast's most dramatic political assassinations is shifting to prosecution, with the convening Sunday of an international tribunal on the slaying of former Lebanese Prime Minister Rafik Hariri. Despite the start of proceedings in the Netherlands, it is still not known who will be accused in the suicide truck bombing that killed Hariri and 22 other people on a seaside street in Beirut on Feb. 14, 2005. Also unknown is the most politically explosive question — whether the proceedings will implicate Syria's government, which many Lebanese believe was behind the murder of a man who led opposition to the long Syrian military occupation of Lebanon. Syria has denied any involvement. Most likely the first defendants before the court will be four pro-Syria generals who led Lebanon's police, intelligence service and an elite army unit at the time of the assassination. They are the only people in custody, though they have not been formally charged. Some in Lebanon doubt the court will ever bring out the full truth, believing it might avoid digging deep to ensure Syria does not react by stirring up trouble in Lebanon and other parts of the region. But who knows? Lebanon experienced its spring of hopes of freedom when it looked like Iraq was succeeding. Yet I was not confident as this drama played out. Then the Syrians and Iranians engineered the spark at Samarra in early 2006 with the bombing of the Golden Dome Mosque that nearly triggered a civil war between Shias and Arab Sunnis within Iraq. Now that Iraq is again succeeding, will the winds of change blow through Lebanon again? And if they do, will America support this change? I am certianly frustrated by Pakistan's inability to focus on fighting the jihadi in their midst. I understand that too many Pakistanis are sympathetic to the jihadis to fully commit to this fight. As I've mentioned repeatedly, it is better to have Pakistan as an imperfect ally than have them as an enemy. Pakistani troops have defeated Taliban militants in one of their strongholds overlooking the Afghan border after a grinding six-month offensive, the general leading the military operation said Saturday. Maj. Gen. Tariq Khan told reporters flown to the area by helicopter that the militancy has been dismantled in Bajur, the most northerly of Pakistan's semiautonomous tribal areas and a gateway for militants entering Afghanistan. "They have lost," he said. "Their resistance has broken down." Khan said he hopes military operations in the tribal regions will be over by the end of this year. Also Saturday, Col. Saif Ullah, a commander in the nearby tribal region of Mohmand, said troops had repelled the insurgency there and that it is "under the control of law enforcement agencies." Pacifying the two regions would be a significant achievement for Pakistani security forces and could lead to a reduction in cross-border attacks on U.S. troops in Afghanistan. I keep hoping that we're averaging out to more steps forward than steps backward when it comes to Pakistan. We can want more. We shouldn't risk less. Guam will take on the role of staging area for defending Taiwan. It is far enough back to avoid getting hammered too much by China, but close enough--with effort--to stage air, naval, and ground power to the Taiwan theater of combat. The United States has begun operating two types of radar-evading aircraft, a bomber and a fighter, for the first time together in the Pacific, the head of U.S. air forces in the region said on Friday. The pairing of advanced B-2 bombers and F-22 fighters in the region follows what the United States and its allies suspect are preparations by North Korea to test fire a long-range Taepodong-2 missile capable of striking U.S. soil. Marines, our best aircraft, Army missile defense troops, submarines, and even an aircraft carrier battlegroup, will be able to call Guam home. Along with forces in Japan, we will be well placed to counter Chinese efforts to conquer Taiwan. Well, as long as Taiwan buys us enough time to intervene. And as long as China doesn't attack before we are finished building up Guam. After years of bitterly debating whether to set a timetable for troop withdrawals in Iraq, Congress has agreed to one. The general consensus came Friday in the form of statements endorsing President Barack Obama's plan to bring home roughly two-thirds of the U.S. military force in Iraq by August 2010. It was a compromise of sorts for the Democratic president, who campaigned on the promise of bringing every soldier and Marine home from Iraq within 16 months of taking office. His plan paves the way for some 100,000 troops to come home and as many as 50,000 troops to remain behind to train Iraqi forces and protect U.S. interests. Not everyone was happy. Democratic leaders have suggested the 50,000 figure was too high and their more liberal rank-and-file swiftly rejected it. Republican leaders demanded assurances the plan would be abandoned if security conditions worsened. At least one hardline conservative cast the timeline as arbitrary and dangerous. But in the end, the Congress that could never agree on how to win the Iraq war found common ground. "President Obama's announcement of a withdrawal schedule for U.S. combat troops in Iraq is good news, because it signals that the war is coming to an end," said House Speaker Nancy Pelosi, D-Calif. The idea that agreeing to withdrawal timeline after we've won is no different an achievement than agreeing to a timeline while the issue is in doubt is idiotic, but the basic assumption of the press these days. That minor detail of "victory" makes a huge difference, no? The very notion that the major disagreement was "how to win the Iraq war" is ludicrous. Ultimately, the major compromise is that our liberal leaders have stopped insisting that we lose the war. You know, now that losing it would require a major effort and put the blame on them. The Left doesn't care, of course, and still wants to lose the war. Too bad, I hope. But I will never forgive our national leaders who have simply wanted to "end" the war regardless of whether we won or lost that war. I have never trusted them with our national defense and still cannot trust them. I trust President Obama wants to win the war now that we've basically won it. I don't trust him on any other national security matter. I've long complained that the global warmers are very time-centric in that they assume that our current temperature is the exact perfect temperature that we should pay any price to maintain. I remember being forced to read Voltaire’s novel, Candide, when I was young. You recall that Dr. Pangloss repeatedly assured young Candide that he was living in "the best of all possible worlds," presumably also with the best of all CO2 concentrations. That we are (or were) living at the best of all CO2 concentrations seems to be a tacit assumption of the IPCC executive summaries for policy makers. How lucky is that? I'm proudly with the global warming deniers in rejecting the socialist solutions to the so-called problem, in questioning whether our impact on climate is anyting more than a drop in the bucket compared to natural forces, and in wondering why our current climate must be defended at all costs. I mean what if the ideal temperature is a few degrees warmer? Or what if it is colder? Until the global warming fanatics can tell me what the ideal global average temperature is, I don't even want to talk to them about "remedies." The president has announced his Iraq plans and I am satisfied with them, as I noted here when the plans were just the leaked previews. More than five years have passed since Bush declared the end of major combat operations in Iraq, a statement that proved false as sectarian violence brought Iraq to the brink of disaster. "What we will not do is let the pursuit of the perfect stand in the way of achievable goals," he said. "We cannot rid Iraq of all who oppose America or sympathize with our adversaries. We cannot police Iraq's streets until they are completely safe, nor stay until Iraq's union is perfected." Good grief. First the reporter shows he doesn't understand the concept of "major combat operations." This refers to the conventional phase of a war when large-scale combat and maneuver is being waged. I declared the end of major combat operations some time in mid-April 2003. That is not the same thing as saying all fighting is over. But after mid-April 2003, we did not face enemy armored units or formed infantry. That's all that meant. And I'd say that Iran and al Qaeda rather than just sectarian differences were the key to the violence. The differences remain even though the violence is dramatically reduced because Iran and al Qaeda in Iraq were smashed up. And then the president sets up straw man to demolish. Who said we planned to stay until Iraq is perfect and only he, President Obama, is now correcting that foolish policy? I long argued--since at least fall 2003--that we didn't have to kill the last insurgent in Iraq, and that our job was to enable the Iraqis to do so. It annoys me that the president presents what we've done all along as somehow his brilliant adaptation to nullify the idiots who thought otherwise. And would it have killed the president to thank President Bush for his resolve that has allowed President Obama to boast of "ending" the war by presiding over the victory he inherited? The long-range Bear bomber did not enter Canada's Arctic airspace but Canadian CF-18 fighters had to order the plane to turn back. The incident took place less than 24 hours before Obama visited Ottawa on February 19. "This is a real concern to us. I have expressed at various times the deep concern our government has with the increasingly aggressive Russian actions around the globe and into our airspace," Harper told a news conference in the western province of Saskatchewan. Back during the Cold War, when the Russian threat was to the front line in West Germany, Canada was the rear area of the alliance. 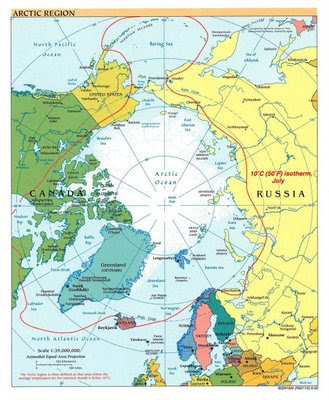 If the Arctic becomes a contested zone against an aggressive Russia, Canada becomes a frontline country. Will Canada build up their military to match their new position? Will Canada want our help? Will NATO help? We need to reorient our alliance a bit, I think. The Obama administration is reversing an 18-year ban on news coverage of the return of war dead, allowing photographs of flag-covered caskets when families of the fallen troops agree, Defense Secretary Robert Gates said Thursday. Just in time for an escalation of our troops strength in Afghanistan, the president is providing the anti-war side with another tool to ensure our defeat by depressing home morale. There is no way to make a casket look anything but sad. And I dare say our press won't provide any context for the deaths of our troops. I hope few military familiies provide approval for filming. UPDATE: More on the decision. the quest to lift the ban has nothing to do with honoring the troops. I'm sure Code Pink and their friends will continue to lobby for blanket permission for film the caskets. One reason I don't like direct talks with the leaders of enemy states is that I fear our talkers will forget that talking is a means and not an objective. Once we start talking to enemies, our talkers begin to believe that getting an agreement--any agreement--to keep the talking going is our objective. Our enemy, being thugs, never forgets they have an objective that they'll happily get talking or shooting. If I could trust our talkers not to forget why they are talking and if I could believe they'll end the talking if it strays from our objectives, I'd be less dismissive of talking to enemies under circumstances short of arranging their surrender to us. But there is another reason I don't like talking to enemy leaders in public forums. Once we talk to them, we have a film record of the meeting and possible hand shake. So if at some time in the future we find we must set aside all talk and do some serious warmaking on our enemy, the Leftists are out in force slamming us for "creating" the enemy, so how can we possibly justify war? Or they'll say we're hypocrites for dealing with them in the past and now we want to get rid of them now that they are of no use to us. If he is so evil, why did we talk to him back then and extend agricultural credits or whatever? Good Lord, we can't shoot at our summit "partner" of all people! So no presidential photo ops with Ahmadinejad, Kim, or Chavez, eh? Could a civil war be brewing within the Russian military? Modernization of Russia's strategic nuclear forces is a top priority for the government, a senior Cabinet official said Wednesday. Deputy Prime Minister Sergei Ivanov said that upgrading ground, sea and air components of the nation's strategic forces is costly but necessary. "It's expensive, it's very expensive, but there is no other way," Ivanov told lawmakers in the lower house of parliament. "We will develop and modernize our strategic deterrent forces." Revelations of significant unrest in a constituency as symbolically important as the armed forces could give additional impetus to growing popular discontent in Russia. Military disquiet could become significant in a behind-the-scenes power struggle at the Kremlin, where factional infighting has grown and there is a widening rift between Mr Putin and his one-time protégé, President Dmitry Medvedev. Resentment within the armed forces is brewing among the oversized commissioned ranks, after the government unveiled plans to trim their numbers by sacking 200,000 officers, including more than 200 generals and 15,000 colonels. Worryingly for Mr Putin, the officer ranks have powerful supporters in a Kremlin faction dominated by ex-military and intelligence officials. Alexander Golts, a leading military analyst, said: "Morale in the navy is very low, particularly in the Pacific fleet. The hazing and acts of cruelty are so unbelievable that a year as a conscript is effectively a year in Hell." With poverty in the provinces, a military feeling abandoned, and faltering oil prices and economic problems battering the once prosperous center in Moscow, is Russia done shedding provinces? They lost Eastern Europe in the first collapse of the Soviet empire in 1989. They lost the near abroad in the second collapse of the Soviet Union in 1991. Is a third collapse of the Russian empire possible? Could Russia's insane focus on grabbing scraps of the Soviet Union blind them to a looming third collapse among the Russian portions of the empire? Russia is the sick, angry man of Europe and they have no idea of their peril from within as they search for non-existent NATO plots against them. Shiite Muslims are shouting anti-government slogans and demanding more freedoms in rare protests amid the minority's worst confrontations in years with authorities in this overwhelmingly Sunni kingdom. Prominent Shiite clerics and intellectuals called on the government Wednesday to launch a fair investigation into a dispute last week that triggered the unrest. Hundreds of protesters in the poor Shiite town of Awwamiya carried banners saying "Down with the government" and spray-painted the slogan on billboards Tuesday, witnesses said. One said youths threw stones at a police post before officers fired in the air to disperse the crowd, which included women. No casualties were reported. Shias are a minority in Saudi Arabia but concentrated in the eastern oil regions by the Gulf. I'll not pretend the Shia are anything but second-class citizens, but a rare protest now is a bit unsettling. Recall that Iran seems to be eying Bahrain lately. Could Iran be up to something? Was Hezbollah--Iran's proxy--quiet during the last Gaza fight because the Iranian mullahs aren't quite ready to attack? If I was going to announce something from Tehran like a nuclear weapons-related piece of news, I might want some convenient chaos in the region to make dealing with Iran seem like a much lower priority item on our presidential to-do list. But I have a suspicious mind, I admit. UPDATE: Iran's economy could be facing a "meltdown." And with an election coming up, would Ahmadinejad find it convenient for his religious views and official future to start some foreign adventure to avoid the consequences of that meltdown? Iranian and Russian engineers carried out a test-run of Iran's first nuclear power plant Wednesday, a major step toward starting up a facility that the U.S. once hoped to prevent because of fears over Tehran's nuclear ambitions. Washington worried Iran would turn spent fuel from the plant's reactor into plutonium, which could then be used to build a nuclear warhead, and U.S. officials pressured Moscow for years to stop helping Iran build the electricity-generating facility. Iranian officials on Wednesday claimed further progress in expanding the uranium enrichment program, saying the number of centrifuges operating at its enrichment plant has increased to 6,000, up from 5,000 in November. So Iran has a couple routes to bomb-making materials coming on line. As we gear up to fight the now-major campaign of the Long War in Afghanistan, I would like to celebrate the death of the term "chicken hawk." haven't heard it in several months, have you? You remember the term, right? That all-purpose bat that anti-war types swung at anyone who supported the Iraq War but was not serving in uniform? The implication was that they were awfully pro-war for people not willing to enlist and fight. The charge was juvenile, avoiding all substance. But if was used a lot by our Left. Now that a president with absolutely no military service history at all, backed by young supporters with absolutely no interest in enlisting in the military at all, is escalating a war in a distant land, you can be sure that our president and those loyal supporters will not be described as chicken hawks. Rest assured, as far as I'm concerned, Afghanistan is America's war and not Obama's war. But this is going to be a tough ride for a lot of people on the left. I wonder how long they last before they bail? Trading fireworks for somber prayer, Tibetans marked Wednesday's arrival of their new year with mourning as Chinese authorities sealed off Tibet and Tibetan regions in western China to foreigners. An unofficial Tibetan boycott of festivities was in memory of last year's victims of a harsh Chinese crackdown on anti-government protests. The Dalai Lama, Tibet's spiritual leader, said celebrations would be "inappropriate." At temples in Tibet's capital of Lhasa, rifle-toting Chinese paramilitary guards replaced crowds of pilgrims, and candlelight vigils were held instead of the usual merrymaking, Tibetan groups said. "The Chinese government is flooding Tibet with troops and attempting to force Tibetans to celebrate the New Year against their will but, in spite of incredible risks to themselves, Tibetans remain defiant," Lhadon Tethong, executive director of Students for a Free Tibet, said in an e-mail. Adding to the tensions, next month marks the 50th anniversary of a failed 1959 uprising against Chinese rule that led to the Dalai Lama's flight into exile. A passenger car at an intersection near Beijing's Tiananmen Square caught fire Wednesday with three people inside, police said, in what may have been a desperate attempt to draw attention to personal grievances. The official Xinhua News Agency said there were two men and a woman inside the car when it was approached by police and a fire broke out. A man and a woman, a couple, were taken to a hospital with non-life-threatening injuries, the agency reported, without saying what happened to the second man. The people in the car had come to the Chinese capital to seek help with "personal problems," the police statement said. It did not elaborate, but petitioners seeking redress for problems with local officials have begun flocking to the Chinese capital ahead of the annual legislative session which begins next week. Who among us hasn't thought of self-immolation when dealing with the local department of motor vehicles? I can't even begin to speculate on a possible reason for three people setting fire to themselves in China's most famous square at this particular time. So we need the facility. It is a good facility. And we're going to close it. I have to conclude I just lack a nuance gene, or something. Gitmo, as the new study documents, is a model prison. It is also a necessary one. Even the Obama administration has come to terms with the fact that we must be able to detain dangerous people who cannot, for various good reasons, be tried in our civilian courts. We need to hold those people, and interrogate those people, somewhere — and Gitmo is the best place we have. We could close Gitmo, and undermine our national security, in an attempt to satisfy the critics. But we’re kidding ourselves if we think they will ever be satisfied. If you're not clear on the Russian defense, the Russians are saying that they couldn't possibly be guilty of trying to deliberately kill off Ukrainians because the Russians were also trying to kill lots of other nationalities, too, in order to extract resources from the countryside to industrialize. Nothing personal, Ukrainians. It was just business. Britain has revealed that, when British troops were under heavy attack in southern Iraq in 2006-7, Iran offered to stop these attacks if Britain would stop trying to halt Iran's nuclear weapons program. During that period, 27 British soldiers were killed, and hundreds of attacks were carried out. Iran was paying over a thousand of Iraqi Shia Arabs about $300 a month to carry out the attacks on the British troops. Britain refused the Iranian offer, and eventually the attacks stopped because British and Iraqi troops killed or arrested most of the terrorists. British and American special operations forces also began working inside Iran, and it was Iran that was persuaded to back off. And Iran wanted Britain to back off on stopping Iran's nuclear-generated electricty program, too! The president has decided we will have our combat troops out by August 2010 (I'm sure it is a coincidence that this will be right before the Congressional election campaign begins). Of course, 30- to 50 thousand American troops will remain under the president's plan. We'll be needed for training and deterrence in case Iran or Syria want to hit Iraq before they build up their conventional warfighting capabilities. And we'll probably need special forces and supporting arms to help the Iraqis with terrorist threats. I'm sure his base will be outraged that so many of our forces will remain, but I'm glad the president doesn't seem willing to lose a war that we've pretty much won. All this is consistent with the Phase VII of the fight that I figured would begin by April 2008, that would have the Iraqis in the lead in combat. The Iraq Basra offensive fits nicely with my guesstimate on timing. I'm happy to say that I was overly pessimistic about how this phase would look even as I thought we'd win in the end. But the point remains that we need to win this phase even as we have pulled our forces out of routine combat missions. And the plan says we'll be out completely by December 2011 per our existing agreement with Iraq. This latter detail will be amended to allow our troops to stay beyond 2011, I dare say. I hope that our "non-combat" troops will include at least several heavy combat brigade teams to aid in deterrence, even if these troops are called trainers or border guards or base security or something. And we'll need forces able to move in quickly with prepositioned unit sets in Kuwait and Iraq itself, including perhaps a set in the Kurdish region to reassure everyone that the status quo is safe. And Air Force elements, too. And I'd like to see a small Marine presence in Anbar since the Anbaris know the Marines the best. Remember, we have to win on the way out just as much as we needed to win the earlier phases to get to this point. Victory is still the objective. Or it should be, anyway. I'm not quite as worried about a commitment to get us down to 50,000 by August 2010. I hope that either it will be safe to do so, or that we'll slow down the pace of withdrawal if we need to. That's what Bush would do. We certainly had hopes at various times in Iraq that we'd draw down troops, but reality led to the scrapping of those projections. I hope that's what Obama will do, too, if necessary. On Iraq, at least, the president seems pragmatic on not wanting to lose a war to satisfy his most rabid base elements. He'll never satisfy them, anyway. Don't doubt we are still needed even if we aren't fighting. We are working on making Iraqi logistical support function without us, but that will take time--longer than 2011 I dare say. Sometimes I forget just how whacked out our Left is. (Tip to Instapundit) When you consider that these are the vanguard of the dormitariate, how can they not believe any silly thing that comes their way that puts America in a bad light? The "peers" of these students liberated 50 million people in two countries. These campus fools, well ... they've got some lovely filth there, haven't they? What can I say? Words escape me. UPDATE: Mad Minerva comments. But no Monty Python comparison. Perhaps she's a tad young to have had the Holy Grail scene leap immediately to mind. When You Start to Take Tbilisi, Take Tbilisi Airport? Felgenhauer predicts that the next Russian assault on Georgia will be a "war to a victorious end." He predicts its main theater could be the road between Gori and Mtshketa just outside Tbilisi. But, Felgenhauer says, Tbilisi itself would not be the Russian army’s top strategic objective: "What is important is not so much Tbilisi. But west of Tbilisi there is the Tbilisi international airport [and] many airfields." This is important, Felgenhauer said, "because right now in South Ossetia we do not have a single permanent airstrip, as the terrain is highly uneven." The closest Russian air base is currently in Beslan, in North Ossetia. The best time for war, according to Felgenhauer, would be between June and August, when high mountain passes are free of snow. He said Russian forces would also need at least two months in hand to wind down operations before winter returns in October. Felgenhauer discounts the eventuality of an intervention on the part of the United States. He notes President Barack Obama’s main goal is victory in Afghanistan, to effect which he will need to transit supplies and men through Russia and countries in its sphere of influence. In exchange, the thinking in Moscow goes, the United States will be willing to trade its interest in Georgia. Thus, to Felgenhauer’s mind, a war is all but inevitable. "The only way you could avoid it," he says, "is if there’s regime change in Tbilisi -- or regime change in Moscow." Trades like that are always mistakes--even aside from the morality of assigning some unfortunate souls to the wrong side of a new iron curtain. If we make such a trade, Russia will get their part fairly soon, while we will need Russia for years ahead in Afghanistan. What else will Russia want to "trade" for Afghanistan? And how soon will it be before Russia decides the only other thing it wants is America out of Afghansitan, and there is nothing to trade? The article certainly shows that Russia learned the lesson of failing to complete the war they started last August. And having failed to finish their war under the first deadline NATO gave Russia for conquering Georgia, I imagine the Russians and many in NATO are eager for Russia to finish the job before Georgia is invited to join NATO. Still, the second war may not be imminent. The Russians probably think they have about four years, at least, to do the deed. Georgia needs to become a hard target as fast as possible so that if war comes, they wage war, too. So Who Created al-Ajmi ? Ajmi chose a different path. Last March, he drove a truck packed with explosives onto an Iraqi army base outside Mosul, killing 13 Iraqi soldiers and himself. It was the denouement of a nihilistic descent that his lawyers and family believe commenced at Guantanamo. When Ajmi returned to Kuwait, "he was a ticking time bomb," said Mansur Saleh al-Ajmi, one of his younger brothers. "Before he went to Afghanistan, he was a normal teenager. He spun the car around in circles. He smoked. People liked him," Mansur said. "After he came back from Guantanamo, he seemed like a completely different person. He stared all the time. You could not have a normal conversation with him. . . . It seemed as if his brain had been washed." Ajmi insisted that he never traveled to Afghanistan, that he never fought with the Taliban -- that he had simply gone to Pakistan to study the Koran and that he was apprehended when he traveled toward the Afghan border to help refugees. Ah, he didn't go directly from parking lot donuts in Kuwait to Guantanamo Bay. He went to Pakistan where he was captured! That might be a clue, no? If I may be so bold, nobody travels from Kuwait to Pakistan to study mainstream, moderate Islam. Pakistan is an industrial park for jihadi indoctrination and training, and going there to study the Koran should indicate that perhaps, just maybe, it wasn't Ajmi's time in Guantanamo Bay that turned him into a suicide-bomber nutjob. In Ajmi's case, however, his behavior at Guantanamo -- his refusal to obey orders, his repeated throwing of his excrement, his hostility toward his attorneys -- struck his American lawyers as a sign of potential danger. Ajmi chose a different path, to be sure. He took a path that many well-off young Islamic men with their own cars and no worries of physical need have taken in the last 30-40 years. A path that predates Guantanamo Bay. A path that predates the Iraq War. A path that predates America, if that isn't too hard to digest. The Post article wants to blame somebody for Ajmi's path. The author supposes that someone is America. The author supposes that Ajmi's accusations about how Guantanamo Bay is run is more true than the more positive review that President Obama ordered. My question is, if the people to blame for Ajmi's path lie within Islam itself, will the story author and all those nodding in agreement with him be as eager to punish the guilty? Just a thought. And yes, I already know the answer. The U.S. Army may kill or delay half of the 27-ton vehicles planned for its flagship Future Combat Systems, hoping to cut costs and stave off more drastic measures by senior Pentagon officials or lawmakers, service sources said. Led by Boeing and SAIC, the $160 billion effort is seen as a likely target for trimming in the wake of hints by the White House and Office of the Secretary of Defense (OSD) that the shaky economy will require cuts to major weapon programs. "We are emphasizing fiscal responsibility," a senior Army source said. One industry analyst said the eight vehicles "will be prioritized" by Army officials, with up to half potentially killed or delayed and others sped up. Sources said four vehicles are likely safe from the axe: BAE Systems' Non-Line-of-Sight Cannon and Infantry Carrier Vehicle, and General Dynamics' Reconnaissance and Surveillance Vehicle, and Command and Control Vehicle. Vehicles seen to be at risk include BAE's Non-line-of-Sight Mortar, Medical Vehicle, and Recovery and Maintenance Vehicle; and General Dynamics' Mounted Combat System. James McAleese, the principal of the McAleese and Associates defense consulting firm, said the Army might buy more currently available combat vehicles instead. And instead of a force of 15 combat brigades within an Army that would include legacy brigades, some of the systems will be spread to the entire Army under changes already made in the plan. I can't imagine the Army really values the Mounted Combat System, which is to replace the Abrams main battle tank, so low. We seem to be making some progress on elements of the vehicle, at least. I have to believe this is a ploy to rank a wanted system low so Congress will fund it anyway. Or maybe critics of trying to build a light tank that replaces our Abrams are coming around to my way of thinking that we can't build a wonder tank. Iraq combat experienced proved the value of heavy armor (of course, I thought the Persian Gulf War showed that, but some may need more proof than I did), and maybe we'll be building modernized Abrams or a new heavy tank for the future force. When the United States was served an eviction notice from its only military base in former Soviet Central Asia last week, Russia scored a tactical victory in its quest to restore military and diplomatic dominance over the energy-rich region. The move would not just kick the U.S. out of a military installation in a volatile area with major gas and oil fields. It also promises to help Russia gain a choke hold over a critical transit corridor for troops and materiel needed to support of the Obama administration's expanded war in Afghanistan. But by pushing the U.S. out, some experts say, Russia may be inviting trouble in a volatile region that could be ripped apart by surging poverty and rising Islamic militancy. The sudden disappearance of American muscle could have a deeply destabilizing effect — and, if chaos follows, the Kremlin will find itself alone in dealing with the mess. Much as I mocked the anti-Iraq War idea that Iran couldn't possibly be a threat to America in Iraq because we both value stability in Iraq, this shows that it is a mistake to judge other countries by what American liberals think. Iran would have rather had chaos in Iraq that they might eventually exploit than a stable pro-American Iraq. And Russia would rather have the sole responsibility for their former republics in Central Asia than enjoy stability partly reliant on American power. On the bright side, our press is giving America a pass on this setback. Can you imagine the press coverage if this event had take place under George Bush's watch? Now, no diplomatic setback is blamed on cowboyish American policies. Hope and change really do work! It's like our entire press corps hit the reset button. We already have sub-state jihadis from Moslem countries waging war against us (though certainly with some state support). We have found electronic components in devices used to target British troops that originally come from Britain," a British explosives officer told Mr. Miliband during a detailed briefing on the type of improvised explosive device (IED) used against British forces. When asked how the components had reached Afghanistan, the officer explained that they had either been sent from Britain, or physically brought to Afghanistan by British Muslims who had flown over. The disclosure is the latest in a string of suggestions from British commanders about the connections between British Muslims and violence in Afghanistan. I don't think this radicalized Moslem effort is the last word in sub-state warfare from inside the West. I think that Westerners will join in the war on terror if they see their own governments refusing to defend the Western way of life that these citizens value. Certainly, many of these types of people have an outlet by joining their military or private security companies. Some can even join the American military. But in many Western countries, joining their military is not the way to defend the West, since their governments refuse to admit there is a problem with militant jihadists. So tell me, are the governments of the West fighting back against the jihadis sufficiently to stifle this possibility? And don't count on Westerners angry enough to wage private war to obey the laws of war much more than our jihadi enemies do. Oh, at first this private warfare will be pretty good. But eventually, those waging this type of war will widen its scope. And this will get ugly. If our Western governments don't get serious about defeating the jihadis and defending the Western way of life and our freedoms, this really will become a war between civilizations as the war becomes part of society. U.S. and Iraqi forces have begun a new military offensive in northern Iraq aimed at rooting out al-Qaida and other Sunni insurgents, American and Iraqi officials said Sunday. The offensive — dubbed Operation New Hope — has netted 84 suspects in the provincial capital of Mosul and surrounding towns, said Iraqi Brig. Gen. Saeed Ahmed al-Jubouri. Most of the arrests occurred in Tal Abta, about 50 miles (80 kilometers) west of Mosul. Claims by Sunni Arabs and Kurds over disputed territory in the northern Ninevah province have fueled significant violence in the area around Mosul, which U.S. officials have called Iraq's last major urban battleground in the war against insurgents. The Iraqi government boasted they'd wreck the remnants of al Qaeda in the Mosul region in 6 months--well over a year ago. I'm not sure if al Qaeda is tougher, if Syria is still filtering jihadis into Iraq to prop the terrorists up, or if the Iraqis just aren't up to the task yet. The more complicated ethnic divisions up there do make it more difficult to get help against all terrrorists. It may be that the Iraqis are making slow progress, of course. But the war is going on and it is important to support the Iraqis in eradicating al Qaeda in Iraq. Remnants could form the core of a regenerated terror campaign at some point in the future. Which is just one reason I'd be more cautious in drawing down our combat forces in Iraq. A Pakistani border region struggling against Taliban and al-Qaida militants will distribute 30,000 rifles to villagers in hopes that local militias can help the provincial government regain control, a top official said Sunday. The missing piece is support for the villagers when the jihadis show up in force to teach them a lesson. The Pakistanis need to have military units ready to back up the villagers. Or maybe we need to take over the whole project. When sub-national entities are threats to our security, we can't let the fiction of national control of a territory interfere with our ability to defend ourselves. Perhaps the Pakistanis will cooperate with us so that our special forces, aircraft, and drones acting in direct support of the tribes, with conventional Pakistani military units on call to provide the muscle to confront large bands of Taliban, will make these militias resilient enough to control their territory. But if the militias are not supported, they'll just get chewed up by the Taliban and al Qaeda thugs who will select targets to make demonstrations of what happens when you oppose the jihadis. More than 70 United States military advisers and technical specialists are secretly working in Pakistan to help its armed forces battle Al Qaeda and the Taliban in the country’s lawless tribal areas, American military officials said. It is a big fight in Pakistan that the Pakistanis haven't been able to defeat. How far will we go inside Pakistan? How successful can we be in pushing Pakistan to stop thinking of India as the main threat to their existence? Good grief, if atomic missiles won't hold off India, are the Pakistanis seriously saying their army will? Wasn't getting nuclear missiles justified on the inability of Pakistan's military to stop the Indians if it came to war? Pakistan needs to switch troops from the conventional order of battle facing east to their own internal jihadi problem. In the battle over radicalized Islamist jihadis, I worry less about the jihadis ability to defeat us than I do our willingness to fight them until we can beat them. Along with the demographic growth has come radicalization: It's not just that there are more Muslims, but that, within that growing population, moderate Islam is on the decline – in Singapore, in the Balkans, in northern England – and radicalized, Arabized, Wahhabized Islam is on the rise. The examples Steyn provides are indeed alarming. And the farce of Britain's Home Secretary, Jacqui Smith, calling jihadi terrorism "anti-Islamic activity" because it tends to put Islam in a bad light is a disgusting signal that we lack the fortitude to defend our civilization. But I don't quite think it is accurate to say that radical Islam is on the rise, as the story headline states. In Islamic nations, the appeal of radical Islam and Islamic terrorism seems to be declining, if I recall polling data correctly. Unfortunately, what is on the rise even as American-led military campaigns in the Moslem world have undermined the appeal of jihad for nearby Moslems, is that Western governments have become more accomodating to radical Islam inside their own countries. Western governments see radical Moslems demand more and these governments dig their heels in to defend further retreat no matter how outrageous the jihadis' demands are. And in addition to the foundering Western governments, unfortunately, Pakistan's government, which oversees the world's biggest concentration of willing jihadi cannon fodder, can't quite resolve to beat those who would kill them all and praise Allah for their good luck in being the generation to do the deed. So radical Islam is rising within the West and in Pakistan's frontier areas due to weak government resolve, but radical Islam is not rising generally in the Moslem world, I think. But have no worries about the West. All it will take is a lengthy and bloody military campaign in Scotland and the Paris suburbs against car bombers and head loppers, and Western Moslems will reject this violence and radicalism, too. Well, assuming the Western governments don't surrender to that, too. UPDATE: Actually, Steyn addresses this Western failure to resist the jihadi ideology well here. As the trauma of the war begins to recede, historians can set about reconstructing what actually happened — and the equally fascinating story of what people thought of it at the time. Though America’s “adventure” in Iraq no longer looks quite so bad, and there are mounting reasons to think that future generations will see it more positively, Ricks remains steadfast. “Fiasco” is still his story, and he’s sticking to it. I don't think much of Ricks' historical analysis, either. He's in way over his head. So is it time to start the victory dance in Pakistan? A Pakistani official says the government and the Taliban have agreed to a permanent cease-fire" in the restive Swat Valley. Syed Muhammad Javed, commissioner of the Malakand region which includes Swat, made the announcement at the Swat Press Club in Mingora. Both sides had agreed to the decision, he said, but would not give more details. Even if Pakistan is permanently happy with the state of events, the jihadis will not remain happy for long being able to terrorize the locals in their region. Eventually, the urge to slaughter those unpious city dwellers closer to the capital will overcome restraint and the simple joy of preventing their own daughters from being educated or seeing much sunlight. In time, after they've recovered a bit from the recent combat, the jihadis of Swat and other covered areas will restart the jihad. I wonder if the people in the region covered by the truce will trust the government to protect them "permanently" when the Pakistani army comes in again shooting? Or will the people figure the army will kill for a bit and then leave again, leaving any unwise enough to openly side against the jihadis to be beheaded and tortured for their foolishness. I'm just hoping this isn't permanently bad. The United States and Syria are exploring the possibility of a new era of better relations after years of tension — but questions remain over just how much common ground exists between the two. A key sign that President Barack Obama is seeking better ties is the flurry of U.S. congressmen who have passed through Syria in the last few days, including Sen. John Kerry, who arrived Saturday and met with President Bashar Assad. The State Department also announced Friday it has scheduled a meeting next week with Syria's ambassador to the U.S. to discuss outstanding differences between the two countries — the first such meeting in months. Those "tensions" and "outstanding differences" include Syrian support for terrorists in Lebanon, Gaza, Israel, and Iraq, for the record. Not to mention internal repression. I mean really, it is far worse than the dreaded Bushtatorship ever got! Some of our Left here want prosecutions of Bush administration officials! I imagine given the differences these same Leftists must be advocates of a nuclear first strike on Syria! So if better relations consist of Syria abandoning its role as Iran's trained Arab poodle and easing off on fascist Baathist Party rule in Syria, I say go for it. Ending one country's support for terrorism is more important than fast justice for thugs who carried out that terrorism. We'll have time for part 2 of improved relations. But if better relations consist of Syria being allowed to continue doing what it has done, while we just say never mind about all those dead American soldiers and Iraqis (and forget about that unpleasantness about investigating your role in Lebanon's bloody recent past)--oh, and here's a nice trade agreement for you--then I say improved relations are a one-way street and should be rejected. I'm guessing Boy Assad is angling for the latter. I'm not sure what our young president is willing to accept. On Saturday, Kerry emerged his audience with Assad to gush about their talks as "very long, frank, candid and open." We have arrived, Kerry told CBS News, at "an important moment of change, a moment of potential transformation." Right. Except it's America that's changing, not Syria—sidekick to Iran, and paragon of "smart" tyranny. In tandem with the congressional stampede to Damascus, the Obama administration has already waived sanctions on Syria to allow for repair of Syrian state-owned Boeing airliners, allowed a transfer of funds from the U.S. to a Syrian charity, and is planning talks this coming week aimed at restoring the diplomatic ties that Bush broke off following the Hariri murder in 2005. Secretary of State Hillary Clinton has talked up prospects of Syria becoming a "constructive regional actor." It's a lovely notion, except that Syria's regime has survived for decades by facilitating mayhem in the region, and then offering its services as a broker to fix the problem. Sure, Syria will talk. Assad in his munificence granted an audience to Jimmy Carter in 2008, and to Nancy Pelosi when she arrived, scarf-on-head, to go nut-shopping in the Damascus souk in 2007. Oh yeah, this is going to work just swell. Obama's top generals in Baghdad are pressing for an elongated timetable, while some influential senior advisers inside the Pentagon are more amenable to a quicker pullout. This article, while pretty good, could leave the impression that the military is divided over the question of whether it is safe for the future of Iraq to withdraw most combat forces faster or slower. The title especially--"even military split over Iraq pullout"--conveys this message. While there is certainly a degree of this debate, most of the debate is caused by comparing the views of officers responsible for different matters. That is, commanders in Iraq are responsible for fighting the campaign there and want the troops there longer. Quite natural. Commanders in Afghanistan want more troops and for the moment, they must come from Iraq. Again, natural. CENTCOM commander has responsibility for both Iraq and Afghanistan and is so pulled in a couple directions, though certainly as the larger fight that has cost the most to get us to this point, Iraq probably pulls stronger on the scales. Army commanders responsible for providing trained and equipped troops for the commander in chief want fewer brigades deployed overseas or more brigades. Drawing down in Iraq a bit faster seems a prudent risk given they don't have responsibility for fighting the wars--they have to provide the forces. And other commanders with other regional or even global views worry about the availability of Army and Marine ground forces (and select resources from the Navy and Air Force that are in high demand) for other non-Iraq and non-Afghanistan contingencies. There is no right or wrong side of the debate here when you look at it from this perspective. It's all about accepting risks: In Iraq, in Afghanistan, in South Korea, in the Taiwan Strait, in the Western Hemisphere, or wherever else leaders have to ponder how we'd use our military in response to a crisis. Personally, given the price we've paid in Iraq to get this far, I'm less willing to accept risk by drawing down our forces too fast. I lean toward Odierno's views on Iraq troop levels. For many of the other potential crisis spots, I think our Navy and Air Force cover the most critical. Further, I doubt our country is ready for a commitment to another significant land campaign that could cause us to endure heavy casualties, so why pretend we need free Army brigades in case another war pops up? I'm not so certain we are ready as a nation to endure the casualties that the Afghanistan campaign will require. And if we are ready to fight a major land campaign that because the nation rallies to a major threat, we have yet to fully mobilize our ground forces reserves for the duration and seriously expand our ground forces for a major conflict. We still have that in our kit bag. So don't pretend that disagreements over the pace of withdrawal from Iraq mean that a faster or slower withdrawal is an academic question with no right or wrong answer, so you can advocate a faster withdrawal secure in the knowledge that someone in the military agrees with you. The people in the military giving different answers about the pace of withdrawal are answering different questions. President Obama has to answer all the questions with one decision--and bear the responsibility for all the consequences for all the questions. He said current EU practices smacked of communist times when the Soviet Union controlled much of eastern Europe, including the Czech Republic and when dissent or even discussions were not tolerated. "Not so long ago, in our part of Europe we lived in a political system that permitted no alternatives and therefore also no parliamentary opposition," said Klaus. "We learned the bitter lesson that with no opposition, there is no freedom." He said the 27-nation bloc should concentrate on offering prosperity to Europeans, rather than closer political union, and scrap a stalled EU reform treaty that Irish voters have already rejected. Klaus said that questioning deeper integration has become an "uncriticizable assumption that there is only one possible and correct future of the European integration." We have been wrong to encourage the formation of the European Union. It perhaps made some sense during the Cold War when getting Europeans to more effectively defend themselves form the Soviet Union was needed. But now? We risk creating what we defeated at great cost. I've been worried about how the EU will evolve and my worries are not allayed. The elites of the EU seem determined to get their EU regardless of the obstacles placed by mere voters. Asked whether Washington would approve an agreement between the Kabul government and Taliban guerrillas along similar lines, Gates replied: "If there is a reconciliation, if insurgents are willing to put down their arms, if the reconciliation is essentially on the terms being offered by the government then I think we would be very open to that. This is not a "yes" in response to that question. Gates simply restated existing policy. If parts of the enemy are essentially willing to give up, regardless of what we call it, we'll let them switch sides. Not all Taliban are created alike, remember. Some who are called that are far from the hard-core terrorists we need to defeat. We don't need to surrender because no matter how much our inept press insists we are losing based on our military casualties or civilian casualties, we simply are not losing and the statistics of these measures don't stand up to a quick analysis. I know our Left is eager to surrender the "good war," too. That was never in doubt. But no matter how much the Left screeches about this supposed failure to excuse their growing strategy of running away, we are not losing. Stop using the idea we are losing as an assumption when deciding what we should aim to achieve in Afghanistan and what we should commit to achieve that objective. It doesn't matter where we house al Qaeda prisoners. Human rights ninnies will complain wherever we put the poor darlings long after Guantanamo Bay is closed--if it is closed. The International Left believes we mistreat the prisoners and nothing will change their minds. They need us to be evil and we will be as far as they are concerned. President Obama is a minor obstacle in this mission, notwithstanding prior complaints about Bush. Military officials are vigorously defending their treatment of detainees at the controversial terror prison camp here, rejecting charges by the prisoners and their lawyers that conditions are harsh, illegal, and inhumane. "There isn't anything we do here that I wouldn't be proud to show my mom or my kids," said Rear Adm. David Thomas, commander of the task force that runs the detention camp. "The conditions of detention are safe and humane," he said in an interview. Lawyers for detainees charge that their clients are being held in severe isolation with little opportunity for meaningful socialization. Horrors! Little opportunity for meaningful socialization? The fiends! Hmm. Although come to think of it, given my work and family responsibilities, that sounds kind of like my personal life. They say some detainees live in constant fear of aggressive guards organized as quick strike teams. So if prisoners riot or throw feces at guards bringing them Korans and rice pilaf, lots of armed guards will react and swarm them to put down the little insurrection? I say the lawyers are right! No more swarming to subdue them alive with minimal injuries! How do the jihadis even manage little riots with such fear instilled? I say just use a couple guards with shotguns and grenades to end the disturbances without the fear that all those guards inspire in the poor misguided poet-prisoners by swarming them in quick strike teams. And they charge that the 40 detainees currently engaged in a hunger strike are being strapped – feet, legs, and head – to restraint chairs and left for excessive periods of time as part of military-ordered forced feedings. We force-feed hunger strikers to keep them alive? Now my blood is boiling. I say let them die of starvation. Better yet, rather than let them suffer by starvation, I suggest we shoot any who are mildly hungry as a sign of compassion. If the lads want to off themselves, I say who are we to stand in their way? I'm culturally sensitive like that. Face it, the human rights industry won't be happy until we release these thugs in Manhattan with a new suit, a fashionable bomb vest, a full body shave, and a tourist map of major landmarks. You mean repeated contact with human rights activists and Leftist attorneys isn't adequate human contact for the prisoners? Ok, I'll give ground on that. Kyrgyzstan ordered U.S. forces on Friday to depart within six months from an air base key to military operations in Afghanistan, complicating plans to send more troops to battle rising Taliban and al-Qaida violence. U.S. Defense Secretary Robert Gates said, however, that he believed the base was not a "closed issue." The U.S. has said it would consider paying more rent to keep the base open. Pakistani militants have stepped up attacks on convoys traveling the primary supply route to Afghanistan in recent months pushing U.S. officials to secure alternative, northern routes through Central Asia. The U.S. announced a small victory in that hunt Friday — saying neighboring Uzbekistan had granted permission for the transit of non-lethal cargo to Afghanistan. With our forces scheduled to double over the next year, this is vital to nail down. I'm just not comfortable at all with this situation. We'd best have serious plans to rescue our troops should the various Stans fail to keep our supply lines open. President Obama promised more diplomacy. "We have to continue to press them," she said. "But our pressing on those issues can't interfere with the global economic crisis, the global climate change crisis and the security crises. We have to have a dialogue that leads to an understanding and cooperation on each of those." Human rights groups, some of whom had written to Clinton last week urging her to make the matter a priority, immediately denounced the remarks. "Amnesty International is shocked and extremely disappointed by (Clinton's) comments that human rights will not be a priority in her diplomatic engagement with China," the organization said in statement. "The United States is one of the only countries that can meaningfully stand up to China on human rights issues," it said. "By commenting that human rights will not interfere with other priorities, Secretary Clinton damages future U.S. initiatives to protect those rights in China." Human Rights Watch said Clinton had "made a strategic mistake in appearing to concede that she expects no meeting of the minds on human rights issues." Wow. The human rights industry that spends most of its time criticizing America and Israel expects us to stand up to China over human rights? Oh well. Clearly they don't appreciate our new nuance. I mean, the big-brained types are in charge at State now! Stand in awe of their powers of persuasion! Is this foreign policy trip the hope part of our new enlightened foreign policy, or the change part? I confess I get confused now and again. Better the Devil She Knows? U.S. Secretary of State Hillary Rodham Clinton said Thursday that North Korea's leadership situation is uncertain and the United States is worried the Stalinist country may soon face a succession crisis to replace ailing dictator Kim Jong Il. Clinton said the Obama administration is deeply concerned that a potential change in Pyongyang's ruling structure could raise already heightened tensions between North Korea and its neighbors as potential successors to Kim jockey for position and power. The implication is that we'd prefer stability to freeing the North Koreans? The implication is that we don't want the Pyongyang regime to collapse because we worry what might happen to North Korea's neighbors? Because tensions could be raised? This is insane. We should want North Korea's regime to collapse. We should be actively working to cause that collapse. If this outcome causes South Korea problems, so what? I don't see the South Koreans overly worried that the existing Pyongyang regime could become a threat to our cities if the Kim regime lives long enough to develop long-range nuclear missiles. No, the South Koreans seem content to let North Korea develop nuclear missiles as long as the North Koreans neither attack nor collapse. Why should we be frozen into inaction because ending the nuclear threat potential to us might mean South Korea will have to face a North Korea that either strikes at them (futilely) or collapses and inflicts massive financial costs on Seoul? Is the existence of one of our cities really less important than South Korea's budget for the next generation? Look, I don't blame South Korea for pursuing their interests. They are our ally but their interests don't necessarily fully match ours. That is normal. But why should we let their interests trump ours? I swear to God, we need to start an American Desk at "our" Department of State. Secretary Clinton is fitting in very nicely over there. I think it has been just over 25 years since the Iranians made a serious attempt to subvert Bahrain, the Sunni-ruled island with a Shia majority that Iran has long claimed as their own. Iranian authorities have recently suggested seating Bahraini representatives in the Iranian parliament, categorizing Ahmadinejad's trips to the island nation as provincial trips, and broadcast interviews with Bahraini Shi'a predicting revolution within a year. Yesterday, Bahrain stopped allowing Iranians to travel to the island, and announced they were cutting off oil imports from Iran. If Iran makes a try for Bahrain, where our Fifth Fleet has its headquarters, I hope we take the opportunity to really work over the Iranian Pasdaran. If Iran is going to test us, let's show them what a test really is. Reducing our Army in Europe down to two brigades as we plan to do is a joke. A part of transformation is, what's the right force posture in Europe to meet the missions that we've been assigned by European Command? I think, again, most of you know the current plan is -- we're at about 42,000; by about 2013 or '14, the current plan is that we would get to 32,000, based principally on two brigade combat teams, one Stryker and one airborne, that we'd retain in Europe. The current -- there are also presently two heavy brigade combat teams. Those are currently scheduled to come back to CONUS in 2012 and 2013. One of the first things I did upon arrival was try to do a -- resourced a mission analysis. And I've recommended to my operational boss, General Craddock, commander of European Command, that we revisit those decisions. And it is my estimation that in order to accomplish the missions that we have, we need a different force posture in Europe than is currently proposed. And we can talk about that a bit if you'd like to. I agree that two brigades is too little. Heck, four is too little. I'd rather see a full division (our new corps) commanding five brigades over there. Anything less risks sending a signal to the world that Europe is not important to us. We may be looking at a Pacific century developing, but Europe is still the most important piece of real estate to keep in friendly hands. And it is a staging area for deployment into the arc of crisis from Morocco to Afghanistan. Since the old-style corps of two divisions and a cavalry regiment are out, let's call it a parachute brigade, a Stryker brigade, two air assault brigades, and two (oops, I mean 1) heavy brigades (well, brigade combat teams, now), with a division headquarters controlling them. And several unit sets for more heavy brigade combat teams should be kept there, too. Here's a history of United States Army Europe for reference. Back when I was regularly writing about Iraq and talking about it on television, I read everything the Washington Post's Thomas Ricks wrote about the war. From his devastating book "Fiasco" to his daily reporting from Baghdad and the Pentagon, Ricks was the nation's top expert on the folly of the U.S. mission in Iraq, from inept prewar planning to postwar execution to a botched occupation that led the U.S. to the brink of defeat without its leadership having a clue how bad things really were. Imagine my surprise, and also perhaps Ricks', to find his new book, "The Gamble: General Petraeus and the American Military Adventure in Iraq 2006-2008," telling an admiring, often inspiring story of the way the American military came back from humiliation thanks to the so-called surge, which so many Democrats, myself included, passionately opposed. If you enjoyed "Fiasco," thrilled to have your prejudices about the clueless Bush administration confirmed, it's your responsibility to read "The Gamble" to have some prejudices challenged. In "Fiasco" decisions are made by knaves and buffoons like Donald Rumsfeld, Iraq reconstruction czar L. Paul Bremer and Iraq's first commander, Lt. General Ricardo Sanchez; in "The Gamble," the action is dominated by men Ricks respects, like retired Gen. Jack Keane, along with David Petraeus and his deputy, Gen. Raymond Odierno. He appears to square the circle by arguing that the war was all disaster until the latest crew reversed a sure defeat with a gamble that led to military victory. Lots on the right argue this way, too. They are wrong. We were defeating the enemies we faced in Iraq until the Samarra Golden Dome mosque bombing signalled the start of the Iranian and Syrian effort to spark a civil war using Sadrists and their Iranian pals on one side and al Qaeda in Iraq on the other. We reacted in the summer 2006 to this new phase of war but our reaction failed to stem the tide. The surge was our adaptation that defeated the enemy civil war strategy. Petraeus and the crew deserve credit for coming up with the plan, getting it adopted by President Bush, and executing it to victory, but the surge built on past success from 2003 through 2005. And even 2006 saw progress in training Iraqis that would bear fruit in the surge in 2007. The only surge gamble was that we could win the war before the Left and their enablers in the press like Ricks could write about Fiasco II: The Surge and lose the war that our military was winning. I still think Ricks is a good reporter. But he is in over his head with strategy and military history. And even writing a book about how we won is unlikely to change my mind on that score. Our State Department and the author Tom Ricks think the peace agreement between the Pakistan government and the Taliban is a good idea. I think it is a very bad idea. But I'm not impressed with the analytical abilities of either Ricks or the State Department. In the debate over the Iraq War, many critics on the Left argued that we were ignoring the true source of jihadi thought--Saudi Arabia--in order to go after Saddam's Iraq. I thought this was just another excuse to do nothing. The idea that we should do something forceful and potentially destabilizing to Saudi Arabia was an idiotic idea and Bush's failure to openly press Riyadh was no coddling but a recognition that the world could not afford such a major oil exporters dissolving into chaos. We have a long way to go in this regard. But we are better than we were on the morning of 9/11. And Saudi Arabia itself is leading the slow charge. It's almost like we practiced nuanced diplomacy the last seven years! The new units are a Marine Expeditionary Brigade unit from Camp Lejeune, N.C., and the 5th Brigade, 2nd Infantry Division, an Army Stryker brigade from Fort Lewis in Washington state. Defense officials said they are still working out final numbers of Marines who will deploy with the 2nd Marine Expeditionary Brigade. A Marine Expeditionary Brigade can vary in size and makeup. Note that these are infantry-heavy formations. The Marine brigade will probably field four line battalions of infantry. The Stryker brigade has three battalions of infantry. Army brigade combat teams now have 2 battalions each of line troops (although they have four companies each instead of three) plus a very light recon battalion. Of course, separate battalions and companies could be added to these units to expand them if necessary. And this number includes units not in the brigades themselves. Ralph Peters is alarmed at this deployment. Peters is rightly worried about our supply lines through Pakistan and the secondary line that Russia controls, although I'm not immediately worried. I've certainly written enough about the perils of this supply line. Call me somewhere in between Strategypage's confidence that Pakistan will remain open as long as our checks clear and Peters' worry that we have the largest self-sustaining POW camp in Asia. And Peters is worried about what we want to do in Afghanistan. Again, I too worry that we are trying to achieve too much in a peripheral region of Islam. And ultimately, Pakistan is the bigger problem here and more troops in Afghanistan help in Pakistan approximately not at all. But I disagree that we should have just abandoned Afghanistan after hammering the Taliban in 2001. Saying we could always return if Afghanistan is a threat again misses the point that the last time they were a threat to us we had 9/11. Are we to just accept these kinds of attacks every decade or so and then send out the punitive expedition? I don't think so. We don't need to turn Afghanistan into Vermont. We don't even need to turn Afghanistan into Iraq. But we need to help the Afghans build a decentralized country that has a national government acceptable to the rural provinces who individually are friendly to us, and a Kabul government that doesn't steal too much national wealth before it reaches the provinces. This can keep the place from being a sanctuary for jihadis who want to kill us. That's more than enough. And for God's sake, get it done fast enough to draw down our forces so that Peters' supply line nightmare doesn't come to pass. God knows, I worry that I don't worry enough about that outcome. But hey, I'm an optimist. I give our Left until the end of September before the first big protests against the newly bad Afghanistan War are held. Just what insulting chant rhymes with BHO anyway? The number of Afghan civilians killed in armed conflict surged to a record 2,118 people last year as the Afghan war turned increasingly bloody, the U.N. said in a new report Tuesday. I'll not hang my hat on the fact that in Iraq (with a smaller population) during the worst of the jihadi and death squad murder rampage during the 2006-2007 period, a couple thousand dead could be the toll of a few weeks. This provides some perspective on the scale of civilian deaths but does not address responsibility or impact. It is responsibility that is the question. And here the UN does a great favor to the Taliban by placing the blame on them for just 55% of the deaths. The 277 deaths from small arms and artillery, presumably, and 552 airstrike deaths are assumed to be fully the fault of the United States and our Afghan allies. The airstrikes especially are usually part of the enemy's propaganda campaign to silence our planes that devastate Taliban groups roaming the countryside. But when the enemy fights among innocent people, it is not our fault if our bombs kill nearby innocents when we target combatants. We are not obliged to hold fire against the enemy just because innocents are nearby. Nor is not our fault if civilians aiding the enemy are later proclaimed to be innocents by the Taliban when the UN teams and reporters come around with cameras and notebooks. These deaths properly should be apportioned to the Taliban for responsibility. But the UN doesn't address this aspect of the war. An American or NATO bomb means the responsibility lies with our side, as far as the UN is concerned. Look, I'm realistic. If the enemy has succeeded in portraying our airstrikes as criminal and the Afghan public is getting mad about it--regardless of whether the scale of killing was dwarfed by the Iraq experience--we have no choice but to hold our fire more often than not in these circumstances. Alienating Afghans will do far more harm to our war effort--and in the long run get more of our troops killed--than letting a particular group of Taliban get away for the moment. We would order our troops to charge through machinegun fire to gain an objective. We can expect our troops to hold fire when the public relations of killing even civilians helping our enemies will harm our cause. It isn't fair, but let's not start whining about what is or is not fair when the mission is to win the war. Certainly, we must work to counter the accepted story that civilian victims of airstrikes are our fault and develop tactics that minimize civilian casualties. But until we do, we can't give the enemy this type of UN-sponsored propaganda victory.